Army of Two: The 40th Day goes out of its way to carry the cooperative experience through all of its competitive multiplayer modes, but thankfully this doesn't mean endless team deathmatches. Rather, you get your standard multiplayer modes like Control (which is more or less capture the flag) and a special mode called Extraction. Extraction mixes elements of Gears of War 2's Horde Mode with Left 4 Dead's constant location changing for a somewhat different experience than what the default multiplayer modes offer. There is a catch, though. Extraction is available exclusively to GameStop any retailer's pre-order customers for the first month. After 30 days, though, all Army of Two customers will get their shot at the bonus mode. Army of Two: The 40th Day is a third-person shooter the relies heavily on cooperative play between two people or one person and an AI-controller partner. EA Montreal Creative Director Alex Hutchinson says that the game is trying to tell a story about saving yourself (and your partner) as opposed to one about saving the world. So expect a lot of running and gunning and be prepared for the co-op strategies to get more complex. A flamethrower character was briefly demoed for games journalists. Then they turned us loose on the multiplayer modes. I played two matches of Team Deathmatch in the Temple map, two matches of Control in the Aftermath and Crossroads maps and one round of Extraction in the Zoo map. The game is due out January 8, 2010. Polish, polish, polish! Seeing a tidbit of singleplayer totally ruined me for the Unreal engine's performance in multiplayer. Whereas the fight with the flamethrower guy was pretty and vibrant, the multiplayer models and environments looked a little rough and dull by comparison. Also, there were significant frame rate issues with the host player's gameplay and one or two connection issues. These are all things that solid polish will fix – but after seeing what happened with the Borderlands hiccups, I think it's important developers get this stuff under control before launch, not after. I Can Get There By Myself: Extraction mode drops players in a map and then sends increasingly difficult wave after wave of enemies at them. Once they've "cleared" a set of waves, they're sent to a new location to face the next batch. The problem I have with this is that the game doesn't let you walk or run to your new location – it just teleports you there and says "hold this position." Like the game doesn't trust me to get there all by myself, or is afraid to challenge me with the difficult concept of "hurry up, but don't ditch your buddy," which drives the other multiplayer modes. Buddy Love: You can, of course, ditch your buddy and hope for the best in all the multiplayer modes. However, the game feels way more fun when you're working with somebody. Having that second player's icon appear on your screen at all times helps you focus on gameplay objectives and can inspire you with neat strategies. Also, going it together means you're rarely ever surprised and you get Achievements for busting up someone else's partnership with a well-aimed shotgun blast. Other Teammates Can Revive You: In Team Deathmatch and Extraction, anybody on your team can revive you when you're downed as opposed to having to wait for your own buddy. This is a little confusing because there's no icon to tell you when another teammate has gone down – just the icon for your own buddy. However, it's convenient because you will get separated from your buddy every so often and sometimes shot up in the process. Cover System: Holding down the A Button makes you run while pushing the analog stick, but it also triggers automatic cover when you get close enough to a wall or an object. However, you're not stuck to cover – you can easily hop over or move around whatever you're in cover behind by mashing A one or two more times. Also, if you happen to be running toward cover, you can let go of A and then mash on it again to slide into cover – which looks way cool and is very convenient for avoiding sniper fire. You Can Turn User-Created Content On Or Off: I can't wait to customize me some pink shoulder pads and an Aggro-happy shotgun. I only hope I'm playing with a host who allows them. 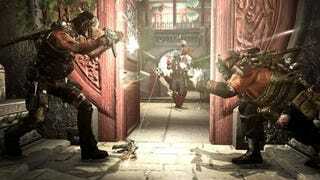 What makes or breaks Army of Two is the partner you play the game with. I got stuck with some bum buddies throughout my multiplayer experience and they made everything sucky and frustrating. Having the right partner who knew what they were doing or at least took instructions, on the other hand, made everything awesome and totally fun. Choose wisely.